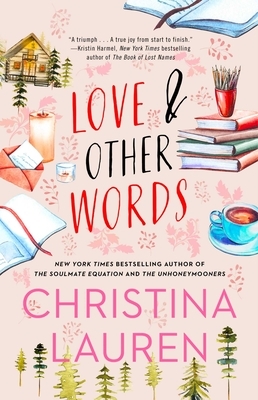 After a decade apart, childhood sweethearts reconnect by chance in New York Times bestselling author Christina Lauren’s touching, romantic novel Love and Other Words…how many words will it take for them to figure out where it all went wrong? "Love and Other Words is a triumph, the kind of book that makes you feel so deeply for the finely drawn characters that you almost forget they’re fictional. You’ll be swept away by the heartbreak, the joy, the chemistry, and the charisma woven through the fabric of Macy’s and Elliot’s star-crossed relationship. As the story unfolds–expertly interweaving the past with the present—you’ll laugh, you’ll cry, and you’ll root for Macy and Elliot to find their way back to each other against all odds. A true joy from start to finish." "Christina Lauren has found a new sweet spot, with heartbreaking and hopeful language that will evoke the whirlwind immediacy of adolescence and the complicated choices of adulthood. Love and Other Words weaves past and present together in an emotional story that will have you declaring your favorite word is LOVE." "Love and Other Words is a beautifully crafted story of friendship and first love, of suffering loss and finding your soulmate. I felt every moment in this book." "With frank language and patient plotting, this gangly teen crush grows into a confident adult love affair."